There are endless opportunities to be creative with Sing Core material. First, though, it’s important that you get a handle on the manufacturing process, so taht you can create the most amazing works of art that are beautiful, eco-friendly, lightweight, and stronger than steel as we continue our commitment to keeping crowd manufacturing alive. 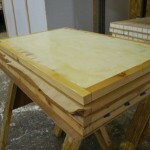 Here is an example of how to build a 2 foot by 4 foot panel using our Sing Core Block. First you lay your bottom skin face-down on your surface. 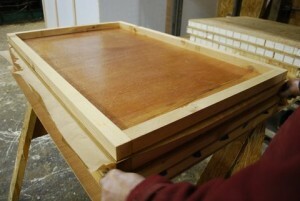 Then you cover with a layer of urethane glue. 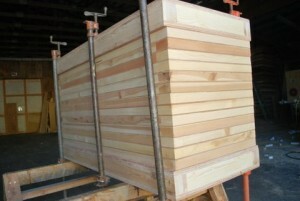 Put your exterior wood staves (edges) into place, as shown in the photo to the right. Sing Core Block is utilizes our, “drop-in,” system. Basically, all you need is to slice the Sing core lock your desired thickness as determined by your specifications. Install your sliced Sing Core Block by placing it inside your wood perimeter to fill the vacant space with Sing Core Block material. Continue to fill the empty space with additional sections of Sing Core Block material until the space is nearly filled. 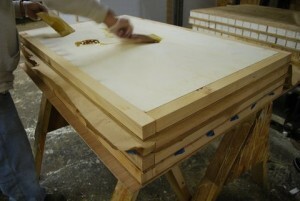 Next apply a layer of urethane glue to the top of all the surface material(s) including the exposed Sing Core Block and the top-side of the wood staves as shown in the photo to the right. The honeycomb torsion box provides the strength, while the urethane glue adds to the structural integrity of the end product, keeping it from delaminating under extreme conditions or over long periods of time. Once you have a nice coat of urethane glue on the entire top surface, you are now ready to apply the top skin. 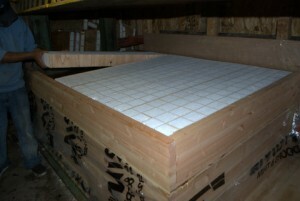 This is a photo of the applied top skins in place. 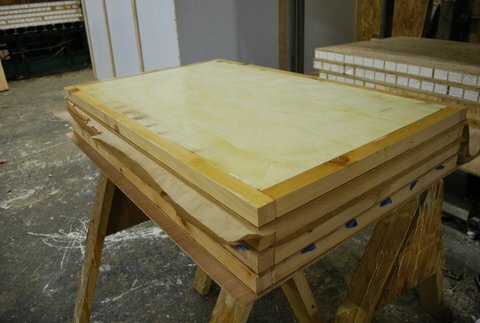 Once you have all your glue and components into place, the panel(s) need to be cold-pressed for proper adhesion and dry-time. Dry times vary according to the type of glue that you use. We suggest using a slow-drying glue for a higher quality end-product. If your facility already has a commercial hydraulic press, then by all means use that. Many of our craftsmen who are Sing Hardwood manufacturers avoid any equipment cost by utilizing the Sing Press model, that is constructed out of perfectly straight Sing Panels on the top and bottom and a few clamps. There is no structural advantage of using a commercial press, as the results are the same. 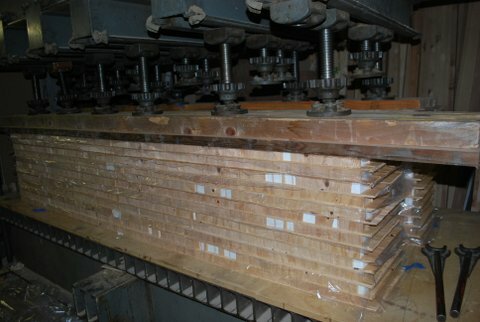 You can see that very little energy is expended in the manufacturing of your Sing Hardwood, and there is little or no waste. In the demonstrations (above) it is easy to imagine that you as the craftsman have complete control of the creation process. 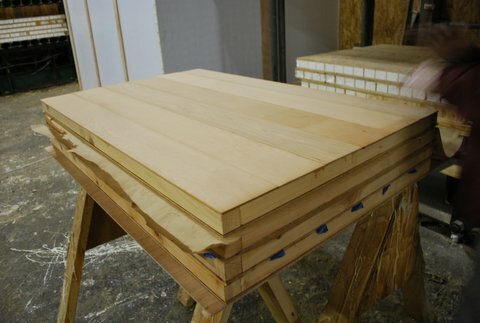 You can make your own Sing Hardwood on-demand at your location, avoiding any shipping expense or time… and if you need a piece of material that you suddenly find yourself out-of-stock… In an emergency, you could make your own (insert any hardwood or lumber product you want) if you have some Sing Core Block on-hand. Sing Core orders certain components by the rail car. We can pass on some of our savings to the craftsmen who use our Sing Core Block technology. 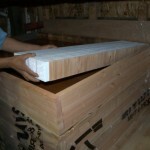 You may find it beneficial to obtain wood staves, hardwood skins, glue (or other materials) from us to take advantage of our bulk buying power. Note: For structural purposes, you as the manufacturer are liable for testing, licensure and code approval. 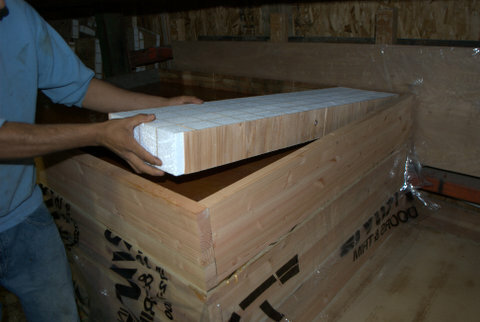 Sing Core is not liable for any unauthorized use of any product created off-site using our patented Sing Core Block material. In the event that you intent to use your Sing Core Block material purposes, we may assist you in the process of getting the required testing completed. 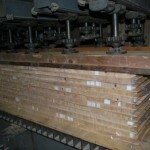 This entry was posted in edu and tagged cold press, create your own hardwood, crowd manufacturing, drop in system, glue, hardwood, hardwood on demand, how to, hydraulic press, sing core, sing press, university, whow to build on October 18, 2013 by lwuadmin.